24/7 ALARM COMPLIES WITH ASTM F2208 AT AN UNBEATABLE PRICE! 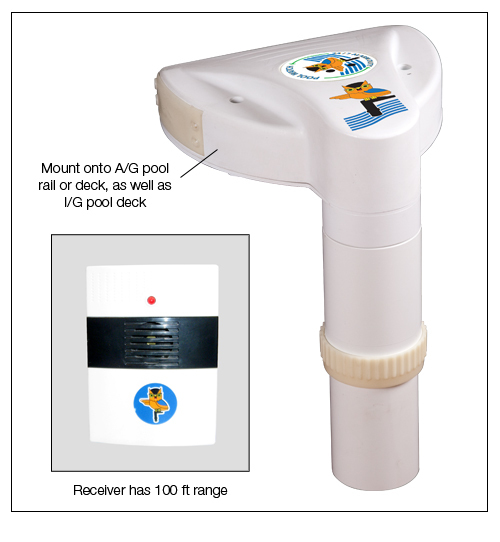 The new Poolwatch pool alarm system works with both above-ground and in-ground pools to provide you with an efficient yet trouble-free solution to pool security. Loaded with patented features, the Poolwatch is designed to make your swimming environment safer for your family, guests and pets. Innovative and intelligent software coupled with high-tech sensors will detect intrusion into the pool by a young child, while not having false alarms caused by wind, rain, floating objects or automatic cleaners. 1 year warranty. • NSF certified to meet ASTM F2208 requirements. Warning: Pool Alarms are NOT a substitute for diligent child supervision or for suitable pool barriers. All children should be carefully watched by a responsible adult when in and around swimming pools.